Massage foot pain away after a long day of work. Prolonged standing or extended periods of walking can lead to achy, tired feet that need to be worked out. Each foot gets its own massage chamber to focus on each area of the foot with incredible rotating nodes working out stressed muscles and tendons. Customize the experience by selecting the level of pressure, intensity of vibration, and heat to get the optimal foot massage. Shuts off after 15 minutes of use. This 17.7 x 15x 18.1 in. device fits up to a size 12 foot. Relieves pain and tension from the feet. Eases the pain associated with plantar fasciitis and other conditions. Increases blood flow through the feet. Improves relaxation through the body starting at the feet. Shiatsu massage nodes allow for a deeper, more powerful massage to alleviate pain faster and more efficiently. 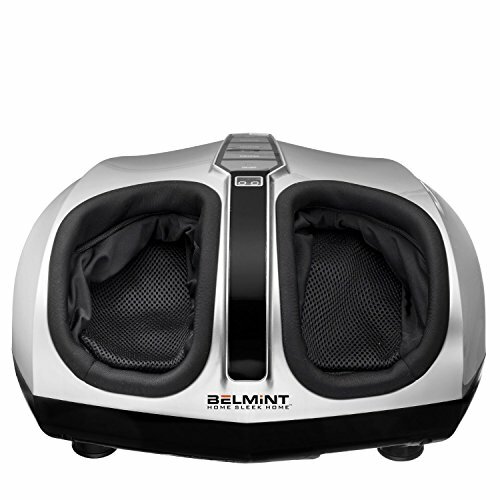 Allows for a full foot massage experience in the convenience of your own home, hotel, or office space. The Journal of Traditional and Complementary Medicine published an article on the power of reflexology. Reflexology effectively helps maintain and improve chronic conditions, including stress, through pressure. The University of Hertfordshire, UK, studied the benefits of foot massages on critical care patients. They found that foot massages led to a notable decrease in blood pressure and heart rate during the massage, which helps improve relaxation.